There is much to be known about search engine optimization or SEO. The assumptions that come about are the exact things that hinder the overall success of any website. The experts at Nolen Walker are here to debunk some of the widely well-known SEO myths. Meta descriptions should be packed with keywords: Google, as well as other search engines, don’t really pay much attention to the meta descriptions. These are merely used to describe the content of that particular page. Although it’s alright to put in a keyword here or there, the meta should be used as more of an eye catcher for potential clients. More backlinks make for better rankings: When it comes to backlinks, it’s quality over quantity. One backlink from a reputable and high authority source proves to be more beneficial than several backlinks to a site of lower quality. The more keywords the better: This couldn’t be further from the truth. Search look the topic itself rather than the keywords that have been stuffed in the content over and over again. 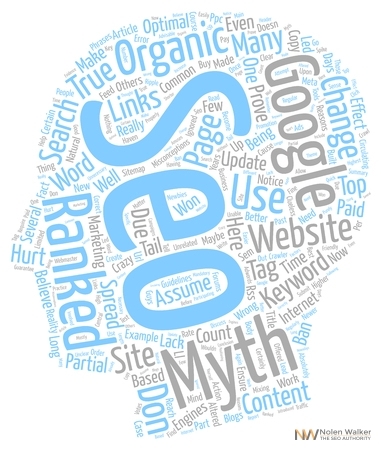 These are just a few of the many SEO myths that we need to leave in the past! Most things that you hear about SEO aren’t true and we want to be sure to get you more educated on this subject. The team at Nolen Walker is here to help you get a premium grade website through top notch SEO methods. Be sure to give us a call at 866-356-8198 to learn more about how we can help better your business through organic SEO. We work with a high degree of integrity and ethics. In helping our clients with their Pay-Per-Click (PPC) campaign, we save them a bundle over resellers. All SEO services proudly performed right here in the USA! It’s all about quality, details, and targeted, ongoing monthly maintenance. Our internet marketing services start with an expertly built website and web presence, and continue with proper ongoing monthly work. Our methods, dedication, and expertise are unmatched! Give us a call today and find out how my team of webmasters can get you the results online that you have been looking for. We help the average small business dominate online in their local market. Proper internet marketing is a journey. Therefore, you need not only your initial website designed and built properly, but you need monthly ongoing SEO services. Our definition of properly is following the rules laid down by Google and delivering what is reasonably asked for. This results in better rankings and a better user experience for searching. Social Media is a necessary SEO tool for any small business that wants to get found online in their market. When it comes to proper SEO, what you don’t do is just as important as what you do. There are literally hundreds of tiny details to take care of to optimize a site properly. The more you do, the more credit -- and higher rankings -- you get. And, of course, a better ranking means more clicks, calls, and leads! The best "How To" SEO advice that I can give is to call the webmasters here at Nolen Walker and let us get to work for your business. A Google-verified website earns more trust, and a more trusted website ranks higher for more keywords. The website that has great, unique content and is worked on regularly for things that ought to be worked on will rank high for hundreds of keywords in the Top 10 of Google, Yahoo, and Bing. Most web companies build their online optimization on sand. We start with a rock solid foundation based upon great content and a full web presence. Then, we continue to build with proper ongoing monthly work performed right here in the USA. Organic SEO, dollar-for-dollar, is the least expensive marketing investment you will make. Our clients stay with us because the service works and is a great value. It is the properly built, well-written, and continually tended to website and web presence that will garner the long-lasting results and keyword ranking that you want. Content is the backbone of a great web presence, enhanced further by monthly ongoing additions of unique, engaging content. More pages of content + regular hands-on work + targeted keywords = higher search engine rankings = more clicks, calls and sales! With Google best practices, the rule of thumb is always: don’t do things that you otherwise wouldn’t do if you were not thinking about optimizing the site for keywords. Organic optimization of keywords is all in the details and dedicated monthly maintenance. Build it properly, maintain it, and they will find it! Write engaging and unique content regularly, make it a good read, and follow the search engines' rules. Expert knowledge of SEO + solid work ethic + great business integrity (i.e. giving the client what they paid for) = very successful websites and very happy long term clients. Local mapping has become a primary way to drive more clicks and calls to local businesses. An internal blog is a great SEO tool and contributes well to an overall web presence. Our seasoned team of professional webmasters, writers, technologists, and designers is ready to be of service to you and your web presence. A beefy, content-rich website is the foundation of a great web presence. Google wants their search engine to look the best. Therefore, they only want to show the best websites and content related to their users' keyword searches. There really isn’t much we don’t do! After the foundation is properly laid, then we go about the good work of ongoing monthly maintenance of both your website and your entire web presence. This attention makes all the difference. We set-up a medley of external sites with all new clients, so they don’t start with just a website, but a comprehensive web presence. We set up our clients' web presence properly and continue to work on the site and social media regularly. This type of search engine optimization effort produces a solid website with dozens of keywords that rank highly in their market, and it’s done according to industry best practices. Follow the rules, keep it natural, and they will come. If SEO services and keyword marketing are done properly (like we do), they are the least expensive marketing dollar you can spend and have the best ROI. We provide premium web design coupled with effective, ongoing SEO. Organic placement of keywords is by far the least expensive marketing dollar that you can spend. Work hard on your content regularly, do the right thing, and Google will reward those hard-working individuals because they have created a web presence and site that the search engines want to show their users. If a new client isn’t set up with a variety of both onsite (your web pages) and offsite (your web presence) components, they simply will not achieve the results that they are looking for. A properly set-up client is a happy client, and a happy client is a long-term customer. Organic search engine optimization for keywords -- when done well -- is the least expensive dollar-for-dollar cost that you can spend for marketing given the return on investment. It’s the full web presence and focused, ongoing monthly work on many aspects of the website that lead to a dominant internet marketing strategy for a local market. A full web presence is more than simply designing and launching a website. Monthly, hands-on work by dedicated webmasters produces clicks and calls for our clients. The website that has great, unique content and is updated regularly in the right areas will rank high for dozens of keywords in the Top 10 of Google, Yahoo, and Bing. Knowing how to write web content is just the start, and it’s one of many aspects of proper SEO. It is a novel, not just a chapter. It is a journey, and not a destination. Call us to kick-off your journey and get your phone to ring. A truly effective SEO company takes the time to perform meaningful changes and maintenance on a monthly basis, each and every month. With Google, it pays to be honest, follow the rules, and work hard like you care about your web presence. Recently, the search engines have begun to reduce the rankings of websites that partake in linking strategies that are against the rules. A horse race is a good analogy to help you understand the nature of Internet Marketing from the perspective of Google, Yahoo, and Bing. When someone follows the Google rules, they don’t have to worry about enforcement. They only have to look forward to well-deserved high placements. Our search engine optimization services start with a properly built website and web presence, and continue with dedicated, ongoing monthly work.